Tired of your kids asking you "What's for dinner?" every night? Danielle McNerney has a solution to get your kids cooking more and give mom a much-needed break. Normally it's Mom you see in the kitchen slaving away at dinner. 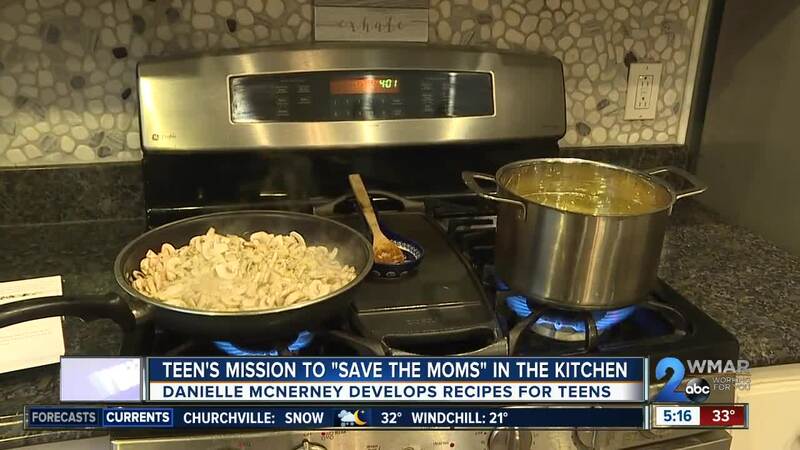 But in the McNerney household, 16-year-old Danielle likes being head chef. "It's really nice when you get to put your own spin on things and be creative with it," she said. Her love of cooking developed a few years after her mom Meredith was diagnosed with breast cancer. McNerney wanted to help out around the house and the kitchen seemed like the best place to start. "My parents have never loved to cook and they weren't great at it either, so my way of helping was helping them in an area that they didn't like." McNerney says the moment she picked up a kitchen knife, she was hooked. She's competed on a couple of cooking shows including Chopped Junior on Food Network, which she won the entire challenge. "I think just having that experience, like knowing how to handle time and work under pressure, really translates into my everyday kitchen," she said. "Because everyone has places to be and you really want your recipes to be short and simple but still super delicious." She turned those skills into a business and began developing recipes teens can easily make so moms could get a break. The company name is also the mission statement: Save the Moms. "I wanted (teens) to save their mom just like how I 'saved my family' from having to be in the kitchen all the time." Her Save the Moms packet comes with 10 recipe cards with cute names like "Straight A Student pork and apples" or "Pasta for Yo Mama." The ingredients are simple and each card comes with safety and clean up tips. Her mom says the packets are well worth the $12 investment. "I cannot tell you how many times I've called her on my ride home from work saying 'Can you please make dinner? I'm running late again', or I come home tired as a working mom," said Meredith McNerney. "So yes, she's saved me many times." McNerney has a website where she sells her packets and posts recipe blogs. Her advice to young entrepreneurs is to have a plan, take risks and dream big. "If Save the Moms could be a household name, that would be insane. That would be crazy."